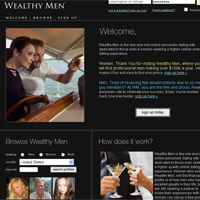 Wealthy Men promotes itself as a web personals site designed as a place for people of a higher caliber to meet. I’ll say straightaway that I had to lie in my profile, because the lowest income range starts at over $100,000. That’s a little more than I can boast that my reviewer’s post pays. All is fair in love and war, I suppose. I’ve often heard that the hallmark of truly refined taste is its simplicity. Simple is exactly how I would define the interface of WealthyMen. You provide few physical details beyond height and body type. You do include your profession and salary, of course. Then you describe yourself and potential date in essay form. Whether you’re male or female, the same process applies. WealthyMen.com has a few extra features that relate to verifying the info you provide. You need to send in a letter from your accountant or even an old income tax form to prove your wealth. You can verify your employment or your photo through other processes as well. That’s as fancy as the site gets, since otherwise it offers little else as far as advanced features go. Localized searches are limited to U.S. zip codes. A few major American cities are also listed. Outside the United States, you are out of luck. You’re stuck browsing entire countries. In fact, if you try to browse Canadian profiles, all the results show up as if the members are from Miami Beach, California. I think that WealthyMen should be more sensitive to the needs of the globetrotting elite that are supposedly its niche. You can only see a few basic profile details before you upgrade your membership. You can’t even tell whether a member has recently visited the site. Oddly, even premium subscribers don’t appear to have any advanced search options. That doesn’t make a whole lot of sense. Moreover, there’s no online chat or even instant messaging, just email. Silver membership lets you to see detailed profiles. You can also send emails to other paid members. A gold-level subscription lists your profile first in browsing results. It also allows you to contact nonpaying site members. The site seems overly simplistic. Its process of verifying profile details is its most redeeming quality. Otherwise, claims made by some members might be exaggerated. I might not be well off. I’m not even middleclass. However, I do know that, generally, rich folks enjoy free samples before deciding to shell out any cash. Not seeing profile details before upgrading makes one hesitant to join Wealthy Men. Having to decide whether it’s worth its monthly fee based solely on verified income status and a picture doesn’t seem to scream a higher-class of dating.